Technically there are only two types of blenders available on the market. But you need to weigh the versatility, durability, ease of use (and cleaning), and of course it needs to look like a regal, space age contraption on your counter. Immersion Blenders are handheld or stick blenders. They are a long, thin device. You hold one end, the other blends. They work well for blending thin drinks, soup, smoothies, and soft components. They take up little space and allow you to blend hot liquids and blend right in a cooking pan. Immersion blenders are practical, simple to use, and easy to clean. For $20 you can get a cheap handheld with no attachments. For $50-100 pick up an immersion blender with a measuring beaker and attachments for chopping and whisking. Cordless, battery operated, and commercial immersion blenders are on the market, too. 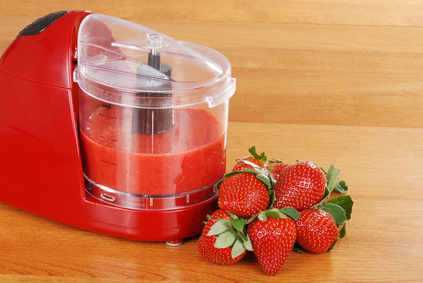 Countertop Blenders may be referred to as jar or jug blenders. The stationary electric blenders are heavier duty than an immersion blender. They are suited for blending drinks, mixing, pureeing, grinding, chopping, and crushing ice. Small personal blenders are perfect for frequent use by one or two people. They are small and inexpensive, but aren’t often the best at crushing ice. If you’re looking to prepare cocktails and entertain, you’ll want a Cocktail Blender with the power to crush ice – preferably uniformly. Dual Wave Cocktail Blenders enable efficient ice crushing and fast mixing. Look for options with large pitchers or two 16 ounce cups. The Hamilton Beach 52147H was recommended by Natural Juicing Remedies. Of course for the shaved ice and margarita lovers there’s the Margaritaville DM3000. If you need your non-GMO soy protein powder and flax seed perfectly blended with fruit – you need a smoothie blender. A smoothie blender will come with a 5-7 cup container and a pour spout. Motor power will range from 2-750 watt. Look for one with multiple speeds and a pulse option. If you make smoothies regularly consider that more power means a shorter blending time. Ninja, KitchenAid, and Oster make decent models. If I can’t afford what I want, I wait until I can. I don’t buy junk. I was given a used (cheap) blender. And it still works, kind of. It doesn’t’ crush ice or blend frozen fruit well. It leaks and smells like it’s burning. But it still “works.” As soon as it stops functioning altogether I’m getting a Vitamix. The Vitamix falls into the Top Performers category. There is no comparison. I spent years in booths at events like the Wisconsin State Fair and NARI Home and Garden Shows. I could give their spiels. (I actually did a few times.) My parents invested in the Vitamix probably 15 years ago (gosh, that makes me feel old). I think they paid $300 for it at the time. But if you’ve seen the demo you understand. The machine is remarkable; durable, versatile, powerful. The thing will last forever. The multi-functional, heavy duty Vitamix is the best rated out there. The Automatic Mix’n Machine earned The Kitchen Innovations 2012 Award. The Cadillac of blenders does so much more than blend. The Vitamix will supplant many other kitchen gadgets. It can blend, chop, grind, puree, crush, freeze, dice, and even cook. Grind spices or coffee, cook soup, freeze ice cream, make peanut butter, crush ice, mix salad dressing, and knead bread dough. I’m getting hungry… I’m getting a new blender. Do you have a favorite brand or type of blender? We’d love to have you share it in the comments below.